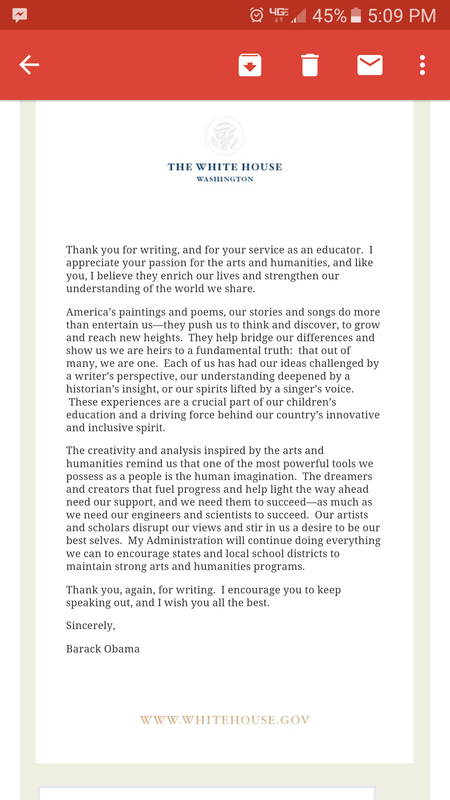 Dear Mr. President, Mrs. Obama, Vice-President Biden and Dr. Biden, Thank you for your continued support of and concern for education and, specifically speaking, Arts Education. In a time when success is often gauged only by numbers on a graph, and scores on a test, the inclusion and recognition of success through creativity, endurance, persistence, reflection, as well as making (visually, spoken, sung, performed) is inspiring and sometimes hard to come by. With programs like Turnaround Arts, the Arts are able to be highligted as an important and essential element to the development of the Individual at any level. I work with the large variety of individuals such as high schoolers of all abilities, special needs adults, and have collaborated with older adults coping with dementia and senility and see, first hand, how the arts positively impact thier lives. Thank you again for your support of education, and especially Arts education, as well as teachers, parents, communities who use, need, and advocate for the Arts. Here is President Obama’s response to my letter.